The old Haunted Hoorah’s days are numbered but there is debate as to when the Buckeye Valley School District will take possession of the property. Jurors awarded the former owners, Brent and Angela Stooksbury, $229,000 to be paid by the school district in an eminent domain case March 28. The school district wants the Stooksburys to vacate the property by May 1. 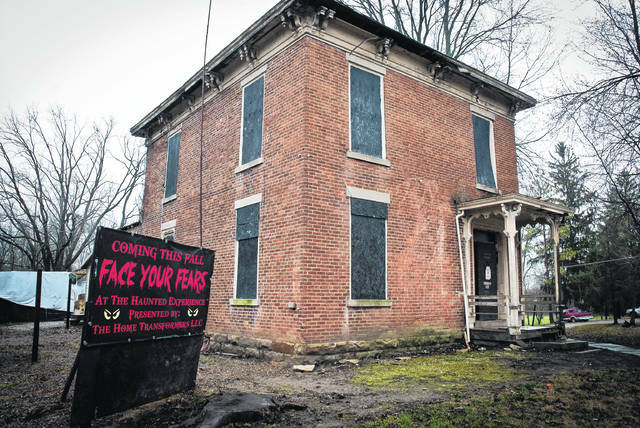 The Buckeye Valley Local School District Board of Education (BOE) has given the owners of the Haunted Hoorah attraction notice to vacate the property at 530 E. Main St., Ashley, by May 1. Earlier this week, the attorney for the owners of the business, Brent and Angela Stooksbury, received a letter serving the eviction notice. Andrew Miller, Buckeye Valley superintendent, said the district needs access to the property to stay on schedule with construction of the new elementary school. The school board is under pressure to fulfill a promise made in a levy issue voters narrowly passed in November 2015 to finance two new elementary buildings — Buckeye Valley East in Ashley and Buckeye Valley West, which is also under construction, in Bellpoint along state Route 257. “We need access to the northwest part of the property to install footers for the west wing of the building (Buckeye Valley East),” Miller said. The BOE filed an eminent domain petition with the Delaware County Common Pleas Court in January to appropriate the property next to Buckeye Valley East Elementary for the construction of a new building and bus loop. The jury decided March 28 that the school district must pay the Stooksburys $229,000 for the property. The day after the hearing, Miller went on the record with The Gazette as to how soon the school district would take possession of the property. Miller said the only part of the property the district needs right away is the northwest corner to continue the construction of the new building. As for the bus loop, “it could wait a little longer,” he said. Miller said in a phone interview with The Gazette Wednesday he thought the school board would still “be willing to look into some options” in working with the Stooksburys. However, “I don’t know how it would work legally if they need to stay there longer,” he said. Brent Stooksbury said he thinks the school board is being unreasonable with the short amount of time they have given them to vacate the property. Stooksbury also said that he wonders how much the school district spent on court costs and lawyers. “They pushed harder than we did,” he said. Stooksbury said actually there was no benefit for his staying on the property, and they could have already moved all the Haunted Hoorah property but had to leave it set up. Stooksbury said he has contacted a moving company and was waiting on an estimate for the cost to move everything. Joe Miller’s associate in the matter, John Kuhl, has requested a status conference with the court to address the important post-trial issues regarding possession of the Stooksburys’ property. According to Stooksbury, the conference is scheduled for today. This entry was tagged Andrew Miller, Buckeye Valley Local School District, D. Anthony Botkin, Haunted Hoorah, Joe Kuhl, Joe Miller, Stooksbury. Bookmark the permalink.